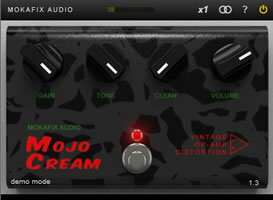 Mojo Cream, Software Amp Simulator from Mokafix Audio. 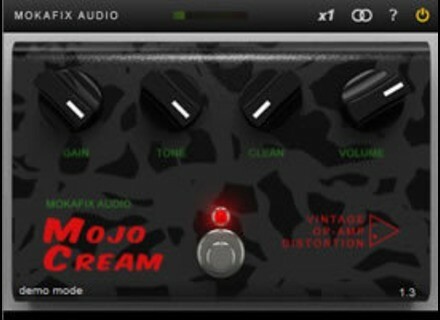 Mokafix Audio has announced the release of a new plug-in, Mojo Cream, and version 1.3 updates for all its effect plug-ins. Mojo Cream is has been added to "Cream Tube" package. Mojo Cream is based on an analogue distortion which is actually a clone/mod of the original TS overdrive Cream Tube is based on. Mojo Cream is purchased along with cream tube as one product. It features the same parameters as Cream Tube + a "clean" parameter that lets you blend dry and wet signals. The wet signal sounds slightly different from Cream Tube too: internal architecture is almost the same. The number of extra modules used by the plugins has been reduced to the minimum. This lets you load more plugins without reaching Windows DLL number quota. NOTE: you can load unlimited instances of one same plugin since a given DLL is only loaded once in memory. All plugins have been improved to reduce "thump" noise on loading.